I just read on Cinema Blend that the epic action film Point Break is being remade and that the studio just hired a director. Ericson Core is going to helm the remake. The remake that takes place in the world of extreme sports instead of surfing. Not cool, brah. Here's the thing, I'd argue that Point Break has already been remade - and that remake is called The Fast & The Furious. Seriously. Watch them close together sometime, it's basically the same movie. Ironically, Ericson Core was the cinematographer on, wait for it, The Fast & The Furious. He was also the cinematographer on the Daredevil movie, which isn't something he should remind people of. Point Break is one of those films that I'm ridiculously fond of - there is hilariously quotable dialogue, crazy stunt sequences, Gary Busey being actually watchable, and Keanu being adorable Keanu. And Patrick Swayze? He's just a delight. Leave it alone folks or you might provoke the wrath of Warchild. 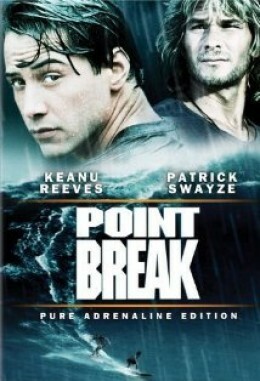 Anyone else as fond of Point Break as I am? Does anyone else kind of love that the director, Kathryn Bigelow, is now a big fancy Oscar winning director?